Thanks for your interest in the Roulette TRADER System! 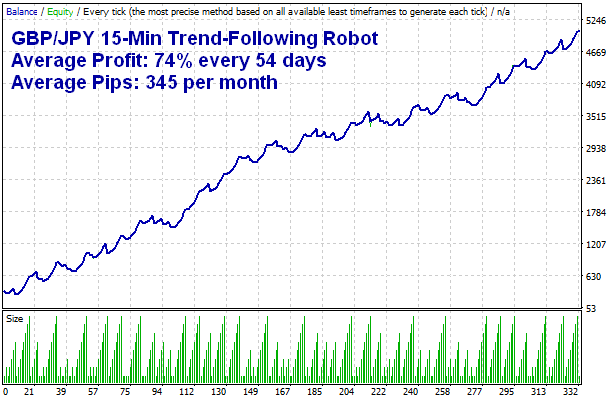 Please register above to access details about my powerful MT4 FOREX Trading Robots, LIVE performance (updated every few minutes), MT4 trading tutorials, and other FREE resources I have waiting for you in the member's area. Thanks again and come join me on the inside! PS - If you have a question, please just ask! I'm very happy with the performance of your 15 min robot. Look the performance this year! PS. The EUR/USD trade was a manual trade I placed by accident. Just to give you an update on my account, it is now at 410% profit! I switched to fixed lots at the end of January so I could withdraw profits whenever I wanted. Unfortunately, I closed my breakout chart by accident and missed the last trade and I also had the robots disabled for the holidays (about Dec 7 - Jan 15), which was a HUGE mistake! I know I missed a lot of pips. I just wanted to say thanks again and give you an update. I really dislike bots but did it of advice from another trader. I must say I liked the philosophy behind what you do and made the plunge. I've actually only used it a few days but it's been excellent! I tend to move my SL's manually anyway but receiving advice and updates via emails is a surprise and impressive!! I use a very small account because I'm trading futures in another account but if this stays profitable I will increase my stake....slowly. Thanks again for a great service! Awesome six months, I love the bots! This is a first for me - the first trades ever taken by a bot that were winners for me. I've tried prolly 30 different ones and they always lose right of the bat and usually never recoup. Congrats to us both! May it continue to be so. 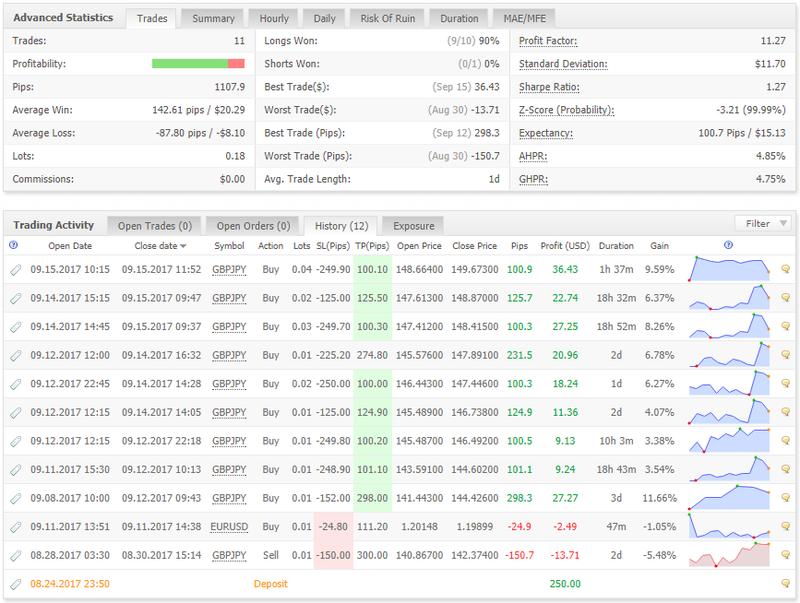 Just to let you know that all is fine with the GBPJPY robots so far... what a great run it has been in the past 2 months. I am very happy with this. thanks for the hard work. I never thought the 15min would get the exit, and was worried (like your emails) about “Oh no, here comes another 250 pip stop.” But, credit to your tighter profit target of 100p, the trade closed with a win. And I had the discipline to leave the robot alone and not mess with it (otherwise, I would have lost the trade). I’m very happy with my Roulette robot purchase. I think you do a wonderful job for your customers. PS. I liked it so much that I’m in the process of doubling the account capital up to 8k, since the past 2 months have been so positive. I’ll probably never get up to 90K like your other client, but I can be very happy where I am. November, 2016: "Thank you Don for everything you have done for me including making this robot [GBP/JPY 15-Min]. This is the first proper money I have made in trading and aside from some sleepless nights the last week its been great. :-D So a personal thanks to you for all the support as well since I started testing back in June. This means a huge amount to me as far as becoming a professional trader. I didn't think this would be how it would end up but its what I see in the future of my trading." January 15, 2017: "Holy crap! That gap down just made me a ton of money. That was the 7th trade. 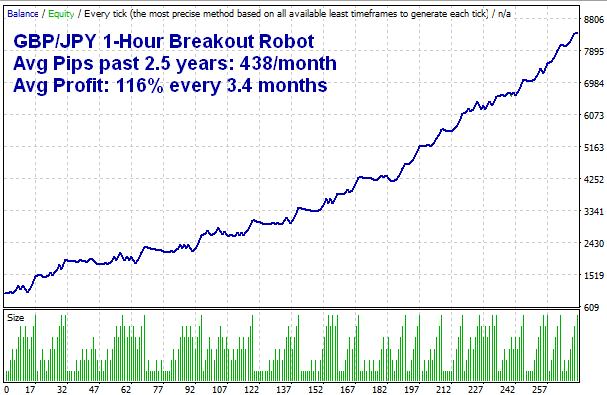 I broke my rules and turned the robot off since that last trade just made the rest of the cycles profit (and more I think). My account is up 160%! Time to take some money out of the account I think. THANK YOU AGAIN DON! You are a genius." April 26, 2017: "Another cycle done! Woop!" May 2, 2017: "Hello Don! I’ve been very pleased with the results of the 15-minute GBP/JPY. I had a 0.05 lot trade opened on 4/18 , closed 4/20 for 100 pip win. Then a 0.10 trade on 4/23 closed 4/25 for another 100 pips, and a 0.15 lot trade on same day (4/25) closing for another 100 pips on the next day, 4/26. Yee-haw!" "This is the first EA that really works. I have tried (15 eas) and am trying about 6 more and they do not work. So thanks for selling this product to me. You have really made this struggle a bit more easy."